Let’s face it; washing dishes is an absolute chore, and the invention of the dishwasher is something many of us are extremely thankful for. 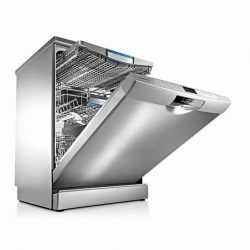 When it comes to dishwashers, however, quality of build and construction isn’t a commodity, but an essential; you need something that can withstand years of rigorous, stress-intensive cleaning without failing the user. Bosch dishwashers prove they know this well, and their line of dishwashers clearly reflects the fact. Much like all their products, Bosch dishwashers are subject to thorough testing during the prototyping stage, enduring all manner of flooding, stressing, and heating before going into production proper. You can rest easy knowing that a Bosch dishwasher is a dishwasher you can rely on. They also feature a range of innovative features that ensure they do their job well; their AquaSensor functionality, for example, uses light beams to accurately detect the level of food particles, grease, or detergent residue present during the wash, and adjusts the water usage accordingly in realtime. If that doesn’t sound promising enough, a number of their dishwashers also include Heat Exchanger functionality, wherein the water is preheated in the rinsing tank to ensure that shock damage isn’t done to more delicate items, such as those made of glass or porcelain. If that wasn’t enough, their range of dishwashers is also incredibly expansive; they offer Freestanding Dishwashers with a sleek and modern design, capable of standing wherever is desired in the kitchen (although they can be integrated underneath cabinets or worktops if desired); Fully-Integrateable dishwashers that will fit in any kitchen of any size or style, perfectly incognito and just as functional as a freestanding unit; and for those of us with very little space to play around with, they even offer Compact Dishwashers that, standing at 45 x 55.1 x 50cm, can fit atop any counter with ease without sacrificing any functionality.